New York Times - "Review: Rihanna, Blissfully Adrift, Juggles Styles on ‘Anti’"
"There are vocal powerhouse pop stars, who dominate with the sheer magnitude of their gift; kaleidoscopically vivid pop stars, who dazzle with enthusiasm and energy; diligent pop stars, who chip away at success until they strike oil; cheeky pop stars, who understand the absurdity of the situation but manage to convincingly stay the course. And there is Rihanna, who is not quite any of these things. That deficit has not proved to be much of an obstacle. More than three years have passed since the release of her last album, and she is perhaps more famous than ever, a star of fashion, social media and tabloids who sometimes, y’know, makes music or whatever." New York Times - "A Very RevealingConversationWith Rihanna"
"Her lips were bright red, her long nails were pale iridescent lavender, her mascara was both white and black in a way I didn’t really understand. 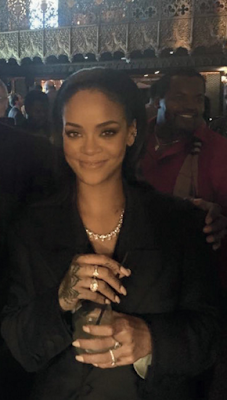 A rhinestone necklace against her chest read ‘‘FENTY,’’ her last name. Oumarou wasn’t the only person I had grilled about what makes Rihanna great. A lesbian art history professor told me that she’s ‘‘the real deal.’’ Others used the words ‘‘magic’’ and ‘‘epic.’’ But when I tried to get anyone to pinpoint things she had said or done — particular interviews or incidents — everyone became lost in inarticulacy. Yet another friend, referencing an episode of ‘‘Style Wars’’ that Rihanna had appeared on, concluded, ‘‘You could just tell she’s a good person.’’ None of this was all that helpful. Rihanna hugged me hello and we sat down in front of two glasses of white wine. ‘‘Your eyes are amazing,’’ she told me, pulling her chair closer. ‘‘I’m staring at you and I feel like my eyes are gonna blur because all I can see are those tiny dots.’’"